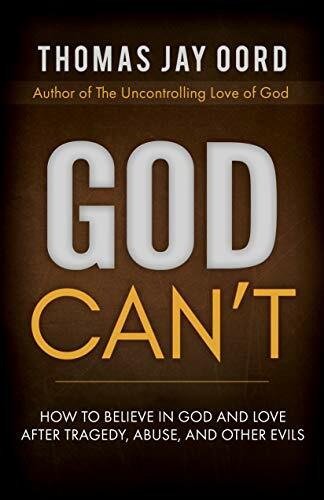 Tom Oord’s new book, God Can’t : How to Believe in God and Love after Tragedy, Abuse, or Other Suffering, reaches straight to the heart of an important matter of Christian belief and experience. It looks at what God is doing when we are suffering. This book seeks to enable those who are in a dark place due to trauma and suffering to believe in God’s love, goodness and essentially non-abusive nature. I think it does this really well. Oord includes stories of people who have been through trauma and have asked questions of their faith and God. I am often a bit sceptical of ‘true life stories’ used in Christian teaching because they seem designed to make a perfect teaching point. Individual’s stories in God Can’t, however, ring true to the complexity of people’s situations and are shared as a way to test what we can know of God in the crucible of our human experience. They add an important dimension to the book. This is a life-giving, hope-inspiring book. It comes highly recommended. God Can’t: How to Believe in God and Love after Tragedy, Abuse, or Other Suffering by Thomas Jay Oord SacraSage Press (5 Jan. 2019) is available now from Amazon.co.uk and in the Leeds Church Institute library.